This book is a very easy read since it is a children’s book, and since it was also a very short book it will be a short review. I think it took me about two hours to finish it, but I still learned something new from this book. The synopsis is translated by me. Rutabaga beef, house pigs and shoes made of fish skin were a part of daily life for Norwegian children from 1940 to 1945. This went along with Swedish soup, air raids, and rationing. This book is an animated description of the daily life and important events during the war told by a 10-year-old boy. It is a book that will give the younger generations the chance to learn more about the war and increase their understanding of these historic events. Language-wise this is a good book even though there are some difficult words spread about. It might be a good idea for children to read this book alongside an adult so they can explain the meaning of these words. Actually, I think this book should be read with an adult regardless due to the topic. Some of the more difficult situations that occurred during the war are explained in shorter chapters, and they are explained clearly and simple which I suspect is so that the child won’t get too stuck on the most horrible parts. The situations explained in this book is done so in a very child-friendly and sometimes humoristic way. The book is written from a child’s perspective and thus it makes it easier for other children to engage in the stories told because they are relatable. There are pictures that illustrate the chapters and these pictures are child-friendly as far as my opinion goes. I do not have children myself, so parents may not agree with me, and I may not even agree with myself when I do get children in the future. The pictures make it easier for the children to create a picture of what is being told within the pages of the book, and this will most likely make the reading more fun for them. There were some famous pictures, but a lot of them I had never seen before, so for me, it was nice to get a chance to look at some pictures. There are not too many pictures in the books I normally read. When the War Came to Norway is a very short book. 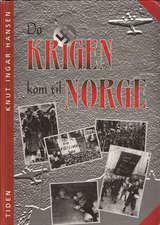 It’s only 79 pages, but it is parted into subtopics like «Norway gets occupied», «Daily life during the war», and «Peace». This makes it easy to follow the historical events for the grown-ups, but it also makes it easy for the children to group events together and make a connection. I think this book is well written, but it may not be suitable for all children. That is up for their parents to decide, but if you are looking for a good book about the war meant for children, then this is a good start. It can be a good idea to start with Norway and then move on to the bigger events in Europe later on. The war can be a lot to take in for a child because it seems so surreal to them if they have not experienced it themselves.